Many of us have LONG bus rides to camp this summer. Instead of just enduring the ride, let's make it a highlight of the trip. 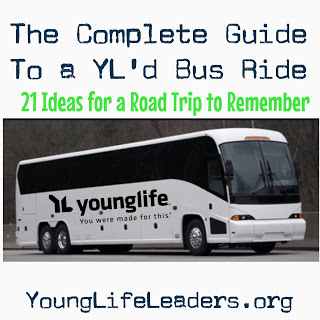 Below are a ton of ideas stolen from many different YL leaders over the years. Start planning now! Why not? You probably already have a guitar on the bus. You can put song lyrics on PowerPoint and link your laptop to the screens. You've already got your Bus Program planned for you here, and you've got tons of games below. Just add a short talk if desired and you've got Club-On-A-Bus! The bus will stop fairly often. 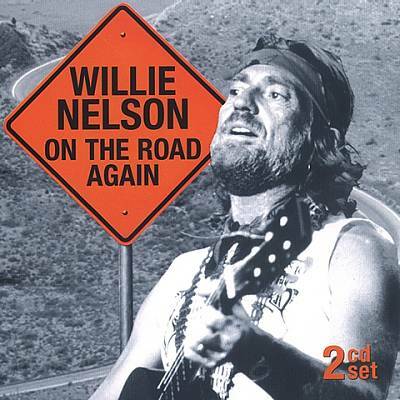 After those food/potty breaks, it's an old YL tradition to play Willie Nelson's "On The Road Again" as soon as the bus starts driving. The first two times you play it, kids might not even notice. By the third time, they'll start to sing along. At the 13-hour driving mark, on your 5th stop, the kids will start booing, demanding you turn the song off. By the 12th stop, on your way home from camp, you'll intentionally not play it...and kids will boo again, this time demanding it. It will become like Pavlov's dog. How can the bus possibly move without Willie singing us along? Years from now, when these campers are parents themselves, they'll hear ol' Willie on the radio and remember The Best Week of Their Lives. It's easy to get stuck in your seat on the back of the bus and miss out on opportunities to meet new folks sitting up front. Odds are you have kids from multiple schools on one bus. Help them get to know one another before they get to camp. It will make their camp experience even better. Also, those relationships will motivate kids to be at All-Area events like Summer Campaigners when you get back home. Here are 50 questions for you to use to get those brains cranking. Everyone is more motivated to play when prizes are involved. You could offer some sweet incentives like $ to the camp store or a free milkshake at the snack shop. One way to keep them involved is to make a poster board with each camper's name. After each game, award each winner a sticky star. By the trip's end, whoever has the most sticky stars wins the prize! My favorite opening mixer to do on a bus is Blanket Drop. It's a great way to make sure everyone knows everyone's name. Divide into two teams, front of the bus & back of the bus. Two leaders hold a blanket up from ceiling to floor. Each team puts one person in front of the blanket on each side. On the count of three, the leaders drop the blanket. Each person tries to say the other person's name standing on the other side of the blanket first. The faster person steals the other and brings that person on their side. The team with the most people wins. You can also play without stealing people and just play to 10 points. Before the game begins, make sure you give a good 5 minutes for people to walk around and learn first names. If you bring an adapter, it's easy to connect your laptop to most bus DVD player setups. If so, you can play some PowerPoint games and make them into contests for prizes. Chad Swanzy has some good free downloadable PowerPoint games at YouthLeaderStash.com You can also download some free ones here. If you're a Young Life leader, you've probably played Mafia. If not, here are the rules. All you need is a deck of cards. This is a great mixer to help folks get to know one another. If you can swing it, I'd create your own version based on the kids going on your trip. In the past, we took one specific fact about each person on the bus and had folks try to figure out who it was. This is another great way to help everyone on the bus get to know one another. Just as we spotlight kids by pulling them on stage at camp, why not do it on the bus? Give each of your friends a chance to hold the mic. They'll share 2 truths about themselves and 1 lie, in random order. Everyone on the bus will get to guess which is the lie. Another similar activity is to have everyone write down their most embarrassing memory. Collect them, then select the best ones. Pull up 3 people to whom the embarrassing moment could have potentially happened. Read the story out loud. Then give each a chance to explain more about what actually happened. 2 of them will be lying, trying to pawn the story as their own. After all 3 have shared, offer a time for questions from the crowd. Then reveal the actual victim. Give a scenario like "Would you rather have 10 inch fingernails or 10 inch toenails. If you’d rather have 10 inch toenails go on this side of the bus, if you’d rather have 10 inch fingernails go on this side of the bus”. Divide it up long ways so people don’t have to walk down the aisle to the front or back of the bus. There are quite a few websites and apps that can help you create questions, but better yet, why not gather a few kids at the front of the bus and let them own this game, coming up with their own questions for everyone? Make your own version of American Idol or The Voice! Search YouTube for Karaoke tracks of fun songs. Have kids write raps/poems about the trip and read them on the mic in front of everyone. A few years back we had 2 guys who rewrote the lyrics to "Hey There Delilah" and changed it to "Hey There Bus Driver." They played guitar and sang it in the mic. Our driver loved it! The possibilities are endless. Similar to 20 Questions: Someone is "it" and thinks of a person, real or fictional, and others try to guess who they are with questions that can only be answered yes or no. A yes answer entitles you to another question, a no means the next person tries until someone guesses the correct character. 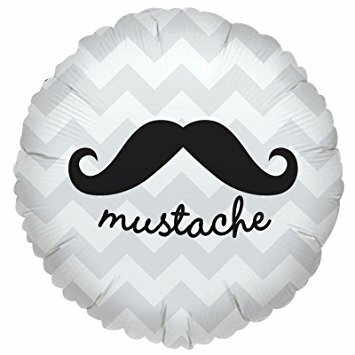 Whoever captures the best random mustache on camera, while at a travel stop, wins a fake mustache to wear proudly at camp. Make sure to get on the good side of your bus driver so he/she will give you freedom to make the bus ride fun. A good way to make them happy is to keep that bus clean. Bring extra trash bags and collect it often! If you have awhile between stops, it's helpful to have a cooler with cold drinks/snacks. Tell kids ahead of time if you're planning on selling them. You don't want to hear "I paid $800 for this trip, I deserve a free coke." You can also play these songs you'll be singing at club on the speakers of the bus, so kids begin to learn them! The possibilities never end. Just take club games and change them to make them work on a bus. Don't settle for a movie marathon, make that ride one they won't soon forget! If you have other ideas to add, email us here.